With the Dark Souls series supposedly over and no Bloodborne 2 anywhere in sight, fans of FromSoftware's unique and challenging series are getting their fix where they can. And if you always found yourself wondering, "What if Dark Souls… but in space?" then may I direct your attention to Hellpoint. 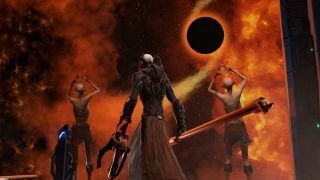 Hellpoint has a free demo you can download and try out on Steam, so you can see for yourself if you like it. I didn't get too far, because it turns out games inspired by Dark Souls are often very difficult - who knew? But I can tell you that at least from my perspective, yes, it is very much that flavor of game. Hellpoint is currently seeking $36,273 on Kickstarter, with the crowdfunding campaign set to close at 8pm Eastern on Tuesday, May 9 / 12am GMT on Wednesday, May 10. If it succeeds, developer Cradle Games plans to release a final version on PC, PS4, and Xbox One in early 2018.